n 132 AD, Zhang Heng, a great scientist in the Eastern Han Dynasty, (possibly re-invented) the seismograph – . . . instrument . . . for forecasting and reporting the movement of an earthquake. It is one of the most brilliant achievements in ancient China. 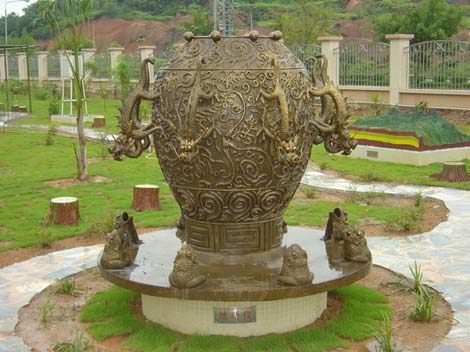 The seismograph is decorated with tortoises, birds, dragons, toads and other animal images, which makes it unique and highly enjoyable. If there is an earthquake, the copper ball inside the seismograph will drop out from the mouth of one dragon and fall right into the mouth of the toad below. (There are eight dragons representing eight directions.) From the falling direction of the ball, we can judge where an earthquake may happen. In addition, in ancient Chinese philosophy, the dragon symbolizes Yang, while the toad symbolizes Yin. Thus, it constitutes the dialectic relationship between Yin and Yang, upwards and downwards, and movement and stillness. Meanwhile, it also reflects the dialectic thoughts in Book of Changes. Thus it is endowed with profound connotations.